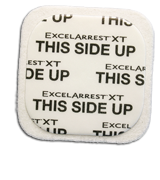 ExcelArrest XT accelerates clotting time, allowing health care professionals to be more productive. This evaluation also demonstrated 100% survival of subjects with lethal groin injury using ExcelArrest XT versus 0% survival in the gauze packing group. Average time to hemostasis was 4.2 +/- 1.5 minutes with the MC (Modified Chitosan) patch compared to no hemostasis achieved in the gauze packing group. ExcelArrest XT is shown to be extremely efficacious for controlling bleeding in coagulopathic patients. In a recent evaluation blood loss was significantly reduced in coagulopathic subjects as compared to the gauze packing group. Post treatment blood loss in MC dressing group was 531 +/- 235 mL versus 1929 +/- 486 mL in the gauze packing group. 1Kilbourne, M., et al, Evaluation of New Hemostatic Agent in a Lethal Porcine Model of Extremity Arterial Injury, 2008. Hemostasis was assessed using a porcine femoral arterial injury model. Fifteen arterial injuries were randomized to either MC p­­atch or gauze application. 2 Bochicchio, G., et al, Use of a Modified Chitosan Dressing in a Hypothermic Coagulopathic Gade V Liver Injury Model, 2008. Blood loss was assessed using a coagulopathic porcine grade V liver injury model. 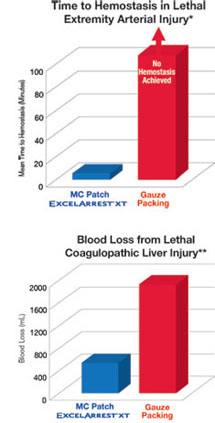 Eighteen liver injuries were assessed using MC dressings compared to gauze packing.